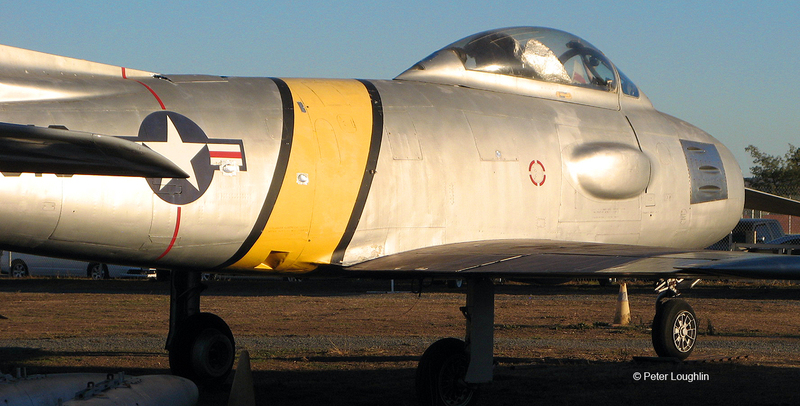 The RF-86 Sabre was a reconnaissance version of the highly successful F-86 fighter. The bulges next to the cockpit housed cameras. But as the gun ports forward of that attest, it still packed a punch in the form of six 50-caliber machine guns. The Sabre was developed by North American Aviation after World War II, and was America's first swept-wing fighter. It saw extensive combat in the Korean War, where it proved equal or superior to the Soviet-built MiG-15 that equipped many North Korean squadrons. Sabres served in the US through the late 1950s, and served with Bolivia until 1994! Our F-86 served with the U.S. Air Force. The Navy had its own version in the form of the FJ-1 Fury. Sabres had a top speed of about 680 miles per hour. 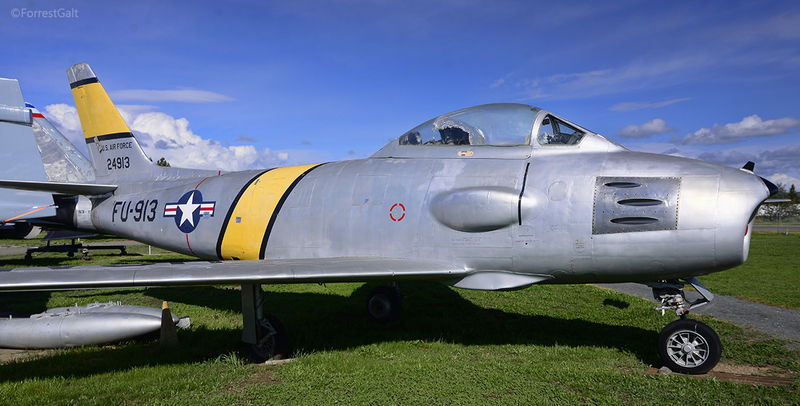 This Sabre was built in 1952 as an F-86F fighter, and served in the USAF. In about 1956 it left US service and joined the Japanese Air Self Defense Force, where it and eighteen others were converted to the reconnaissance RF-86F configuration. It served with Japan until the mid-1970s, then ended up back in the U.S. to be used as a target drone. PCAM obtained her and restored her before she was used for target practice. The F-86 was developed in the late-1940s, and was America’s first swept-wing fighter. It was the premier USAF jet fighter in the 1950-1953 Korean War, where its main adversary was the Russian-built MiG-15 Sabres were armed with six .50-calibre machine guns, three on each side of the pilot. In Korea the Air Force wanted a high-speed reconnaissance aircraft that could take pictures over enemy territory and be fast enough to escape attack by the MiGs, so a small number of Sabres were modified in the field by removing the guns and replacing them with cameras. The film magazines were housed in the large bulges that you see on each side of the fuselage. These disarmed aircraft were renamed RF-86s, and flew their photo missions along with armed F-86s for protection. 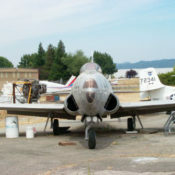 Pacific Coast Air Museum’s Sabre was built in 1952 and served in the USAF as an F-86F fighter until about 1956, when it left US service and was sent to Japan. Along with eighteen others, it was modified to RF-86F configuration by Mitsubishi Heavy Industries, and served until the mid-1970s in the 501st Teisatsu Hikotai (Reconnaissance Squadron) of the Japanese Air Self Defense Force. Eventually the airplane ended up at the China Lake Weapons Testing Center in the Mojave Desert, where it was to be used as a target drone. 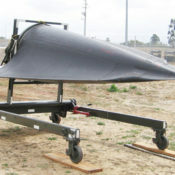 The Pacific Coast Air Museum was able to obtain it from China Lake on permanent loan from the National Naval Aviation Museum at Pensacola, Florida. Our museum volunteers have restored it in the colors and markings of the USAF’s 4th Fighter Interceptor Wing of the Korean War era. 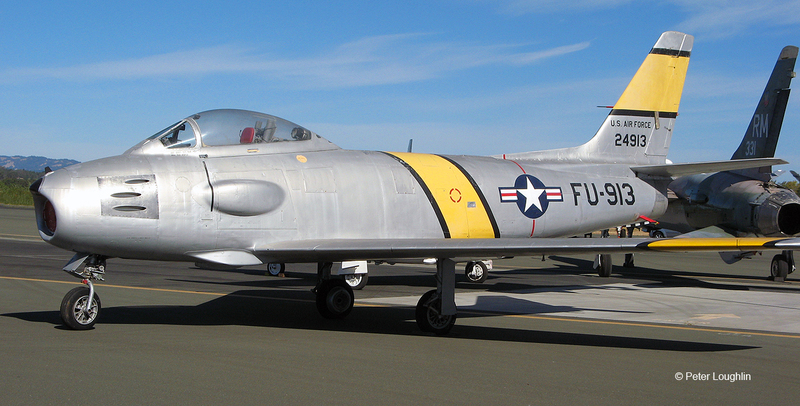 Pacific Coast Air Museum’s RF-86F Sabre was retrieved from the Naval Weapons Test Center in China Lake, CA. The aircraft was part of a fleet used as remote controlled drones for weapon testing (as in they shoot missiles at them!) We are very happy to have received the aircraft before it was used for that purpose. 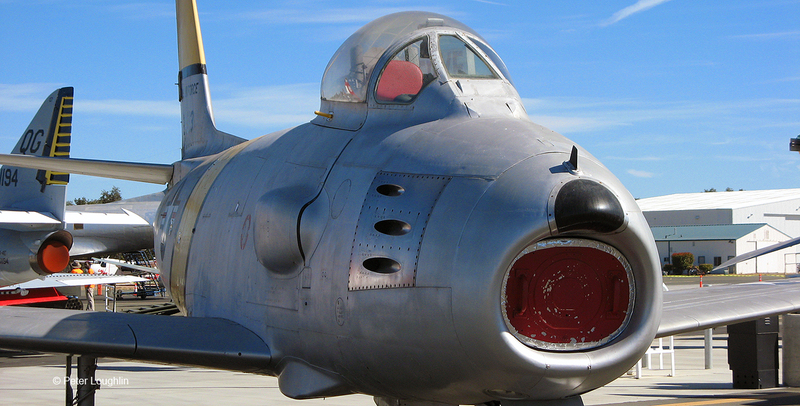 The following is a brief history of the development of the RF-86 aircraft type. The author, Bob Archibald, has been collecting information for the purpose of publishing a magazine article and provided PCAM with this synopsis. The RF-86 is a plane that was developed in the field and not in the factory. After the Chinese entered the war and supplied a large number of MiG 15’s it became too dangerous for the Tactical Reconnaissance planes operating in the theater. They could not fly into the areas around MiG Alley (the Yalu River valley) in the currently available planes: RF-80, RB-26 (the recce version of the A-26 we have), and Marine recce (Banshees I think). These were all too slow. Pilots who normally flew these missions, the 15th Tactical Reconnaissance Squadron (TRS) at K-14 (Kimpo), realized they needed a recce version of a plane that COULD get on in an environment dominated by MiG’s and Sabres. Why not modify a Sabre to do the job? No one was interested, but they convinced the commander of the 4th Fighter Group (on the same airfield) to let them play with a scrapped fuselage of an F-86 in the dump. They took it apart, removed some guns and found a place for some cameras. They convinced Far East AF Hq in Japan to modify two war weary F-86A’s with the camera installation. It was done at Tachikawa in Japan and the first RF-86A’s flew in the winter of 1951 (?this is without reading my notes). They flew the planes in a mixed formation of F-86 fighters and one RF up to MiG Alley, took their pictures of POW sites which Hq badly needed, got away with it and the generals liked the results. They now made six more RF-86A’s and flew them regularly (that is half the squadron flew the RF-86 and half flew the normally assigned RF-80’s). The fighter fleet then transitioned to better F-86’s with better flight controls, better turning wing configuration, etc. It was necessary to update the recce so they modified a few F-86F’s into a similar camera configuration. That plane, the RF-86F, reached Korea in spring 1953 and flew until after the armistice in July or August 1953. These planes did not have the chipmunk cheek bulges on the upper gun doors like our plane does. Some where along the line the generals decided they needed better photos from the 86 and someone designed a version with 40 inch split vertical cameras. These were bigger and the film magazine at the top of the 40 inch lens caused a large bulge or blister to be added to the side of the plane just below the canopy. That version is our plane. There is some controversy about when and where that version was modified and when it went into combat. The best expert today in the F-86 series is Larry Davis who is the editor of Sabre Classics and author of several books on the 86. He thinks the chubby cheek version went into combat in Korea in the early summer of 1953 just before the armistice. However, I have friends who were the pilots flying then and say “Not so!” They say this version did not start flying until spring 1954 when the 15th TRS moved from Korea to Komaki, Japan. While at Komaki, everyone seems to agree that the chubby cheeked RF-86F flew clandestine spy missions over the mainland of Korea (? ), Manchuria (? ), China (? ), or Russia (?). Some of the pilots have described their flights but most believe that the missions are still highly classified and won’t talk until cleared by the National Security Agency. Since the Korean War is still technically at war, and a peace conference is now being forced on North Korea, there may be some reluctance to give official permission to talk. You see, the photography they probably took (and they will still not tell me what it was) forms the basis for a series of armistice violation complaints going back to 1953 and 54. I have color pictures of the RF-86F (like ours) in Korean War colors, and the airplane is considered to be that vintage. 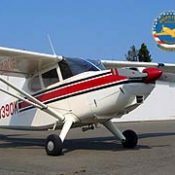 Now about our individual aircraft: we have the USAF records for the plane and it does not appear that this plane was in Korea at all. Nor is it clear that it was modified into an RF until about 1961. It is sure that the plane served as an RF-86F for the Japanese Air Self Defense Force, and we have color photos of this plane in Japanese markings. In fact, the Japanese markings can still be seen at certain light angles to match our photos. All that being said, the RF-86 was a significant and largely unknown combat plane in the Korean War and afterwards. The plane was only flown by the 15th TRS but for concealment, it was always marked as if it were a fighter 86 assigned to the 4th Fighter Group. Those of us who have been researching the model think it is altogether proper to mark and display our own aircraft in the Korean War markings of the other 15th TRS aircraft. This would recognize the outstanding achievement, still largely unknown because of security classification, of those pilots in that squadron. Fixed: This reconnaissance version of the F-86 typically carried no guns, though some had two 50 caliber machine guns. Cameras: Two K-22 Split Verticals with 40 inch focal length lens cone, one K-17 Vertical, one KA-60 Nose Oblique.